If your patio butts up to the back of your home you will want a way to access it. A patio door gives the added benefit of giving your room more light and introduces your room to the garden and visa versa. While the actual opening isn't that much bigger than an ordinary door, the broad expanse of glass across the two panels creates a feeling of spaciousness and helps connect the room to your patio in a visual way. Strictly speaking, A patio door has a fixed panel and a sliding door panel. They are available in UPVC (as above), aluminum and in a variety of hard and soft woods. Patio doors usually replace a large window that looks onto the garden rather than replace a back door. This avoids the added cost of installing a lintel. Fitting a patio door is fairly straight forward and almost all window replacement companies will take on the job. 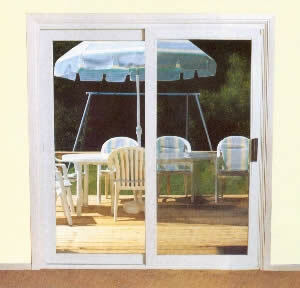 Some modern patio doors offer a tilt opening for ventilation allowing you to leave the panel slightly open yet secure. All new patio doors should come with at least a 10 year guarantee.